There’s an interesting new hardcover graphic novel coming this June from Archaia Entertainment, written and illustrated by Shane-Michael Vidaurri, with the unusual title of Iron: Or, The War After. See what you think of this description: “It is the aftermath of a long war, in a world of constant winter. 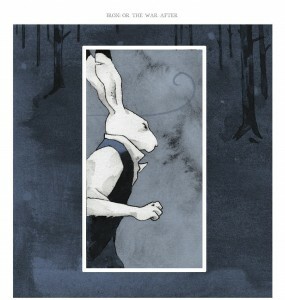 An intelligence spy from the Resistance—the rabbit, Hardin—steals secret information from a military base of the Regime. His actions set off a chain of events that reverberates through the ranks of both sides, touching everyone from Pavel the crow to Giles the goat, from the highest-ranking officials to the smallest orphaned child. When the snow finally settles, who will be the true patriot.” Find out more (and see a multi-page teaser) at Archaia’s preview page.